The key element to captivate me about a brand is it’s narrative and that connection leaves a forever impression. I first met Marwa (co-founder of Vela Scarves) when she requested to pull pieces from Haati Chai on her past campaign with Babbu. At the time I had no clue who Marwa was and although I normally look up everyone we are collaborating with I pretty much skipped this detail since a mutual friend had introduced us. I automatically was like “Sure no problem” and loaned her our jewels for her shoot. Since then I’ve gotten more familiar with the brand — it’s vision, the lifestyle, and Marwa for the unique, multifaceted power-woman that she is. In the past 8 years Marwa has cultivated a unique culture to fill a void for something her consumer was missing — stylish scarves specifically for the American Muslim woman. Being the creative that she is, she offers her customers a quality product and wardrobe staple mindful of modest fashion. It’s a complete reflection of everything she is and her growing fans-base love her for this. With Vela’s latest collection, we understand the brand as a lifestyle. 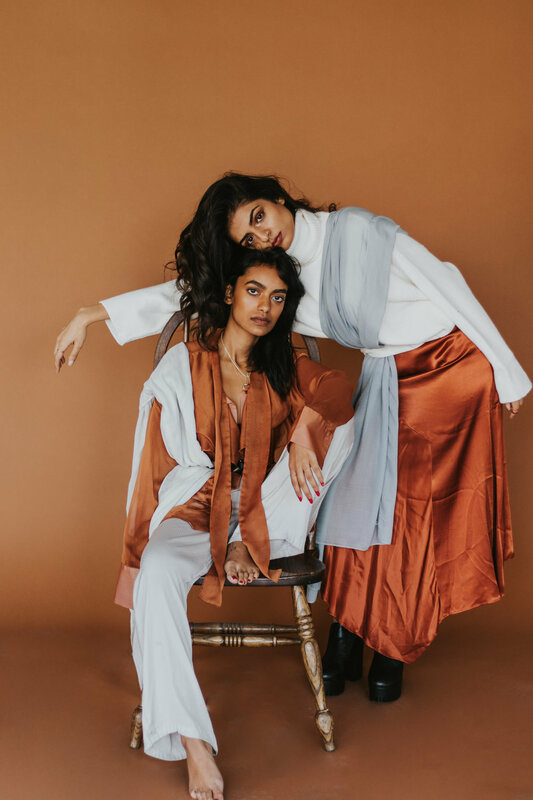 Vela has grown to much more than offering fashionable scarves but has redefined society’s understanding of many rarely discussed topics such as the beauty in modest fashion, islamic norms, unity within diversity. In 2017 I grew a lot - emotionally, physically, professionally. I learned about who I am and what I truly believe in. I learned that many of the beliefs I now know I stand for should have been apart of my confidence as a young brown girl. Growing up I didn’t have campaigns like this to empower myself and I am so emotional knowing that I was able to take part in Vela’s bigger vision -- to identify and embrace different cultures. I am honored to have this voice in our society and I feel it is my duty to contribute however I can to the next generation’s self image more than anything. use code Stella25 for 25% OFF your order.